No zip, no zap . . . The perfect board book for tired toddlers. This charming and cozy entry in the Snuggle Time series is now in board format! Every day’s a busy day, with places to go, people to see, and things to do. But sometimes all that activity leaves a toddler tired and cranky. What time is it then? NAP TIME! 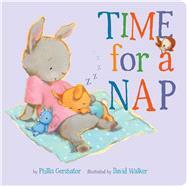 With plenty of humor and fun, Phillis Gershator and David Walker capture a child’s resistance to some much-needed sleep—and the Illustrations show little bunny throughout the days of the week, adding a concept lesson to the great message about the necessity of rest. Phillis Gershator has written many picture books for children, including When It Starts to Snow (Henry Holt), Listen, Listen (Barefoot Books), and Time for a Hug, Time for a Bath, and Time for a Trip (all Sterling). She lives with her husband and frequent coauthor, David, in Brooklyn, NY. For more information about Phillis, see phillisgershator.com. David Walker is the illustrator of numerous children's books, including Before You Were Mine (Putnam); Time for a Hug, Time for a Bath, and Time for a Trip (all Sterling); and Bears on Chairs (Candlewick). He lives in Chapel Hill, NC. To see more of David's work, please visit davidwalkerstudios.com.